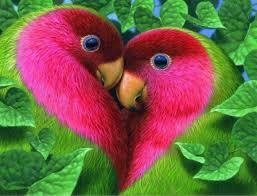 Life For Animals: Birds Fall in Love too...! Birds Fall in Love too...! A speed dating experiment has suggested that birds and humans are remarkably similar when it comes to choosing mates and falling in love. Using a population of 160 birds, these researchers set up a speed-dating session, leaving groups of 20 females to choose freely between 20 males. Once the birds had paired off, half of the couples were allowed to go off into a life of 'wedded bliss'. However, for the other half, the researchers intervened, like overbearing Victorian parents, splitting up the happy pair, and forcibly pairing them with other broken-hearted individuals. Strikingly, the final number of surviving chicks was 37% higher for individuals in chosen pairs than those in non-chosen pairs. This research proves again, that non-human creatures too have emotions. They each also have a distinguished personality, and they too deserve the same respect and dignity that we are expected to give to any other human.